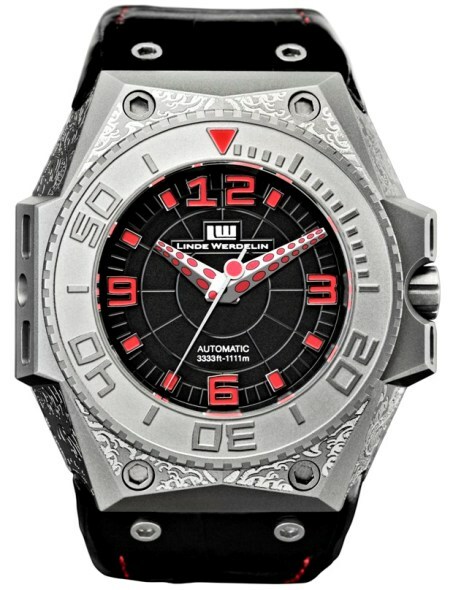 Back in 2010, Linde Werdelin presented a very interesting timepiece (Oktopus Tattoo). The new Linde Werdelin Oktopus Moon Tattoo Limited Edition watch, is based on the Oktopus II Moon that was revealed on this year’s Baselworld trade show. We can clearly see that the new model is inspired by its predecessor. The 44 mm wide case is crafted in solid 18K rose gold, and has been intricately engraved “tattooed” with a hand drawn octopus. Particular materials such as rose gold, ceramic and titanium have been implemented into the case. The entire surface is subsequently sand blasted resulting in microbillé, followed by a hand satin finish. The case is protected by a black ceramic bezel, and the titanium DLC case-back features the iconic hand-drawn octopus. The watch comes with a multiple-layered skeletonised dial and with diamond-cut hands, it also bears an engraved hand-drawn octopus in the center. All indices are deliberately luminous to enhance readability. Fitted with LW’s in-house moon-phase complication, adds further visual with its luminous and hand-drawn moons-phases to this unique state-of-the-art timepiece. The full moon is always indicated with a red mark visible through the lower dial. Numerals 11, 10, 9, displayed between one and two o’clock allow a more precise track of the lunar cycle. It indicates two moon cycles of 29.5 days each, before the moon returns to the same point on the celestial sphere. As always the watches from Linde Werdelin are equipped with their proprietary attachment system for the strap.